To investigate the association between distal clavicular osteolysis (DCO) and bench pressing intensity. 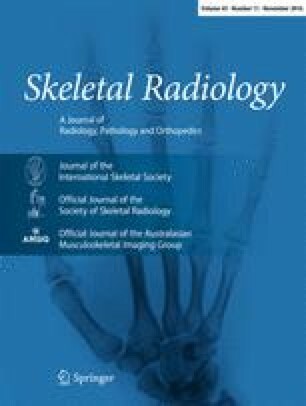 From a retrospective review of MRI shoulder reports of individuals between 20 and 40 years of age, 262 male patients with DCO and 227 age-matched male patients without DCO were selected. All patients had completed a bench pressing questionnaire. The patients’ bench pressing frequency (times per week), duration (years of bench pressing), bench pressing weight (maximum bench pressing weight with one repetition = 1RM) and the ratio of bench pressing weight to body weight were compared between both groups using Chi-square and Mann–Whitney tests. The results showed that 56 % (146/262) of patients with DCO were high-intensity bench pressers (1RM more than 1.5 times the body weight) compared to 6 % (14/227) in patients without DCO. High-intensity bench pressing was a risk factor for DCO (OR = 19; 95 %CI = 11–35; p < 0.001). Low-intensity bench pressing (1RM less than 1.5 times the body weight) was not a risk factor for DCO (OR = 0.6; 95 % CI = 0.4–0.8). High frequency (>1×/week) and duration (>5 years) of bench pressing were risk factors. In bench pressers who suffered from DCO, the mean 1RM was 283 lbs (±SD 57) compared to 209 lbs (±SD 60) in bench pressers not affected by DCO (p < 0.001, Mann–Whitney). High-intensity, but not low-intensity bench pressing is a risk factor for DCO. Institutional review board approval was obtained and the requirement for informed consent was waived. Sports and Fitness Industry Association. Press release. https://www.sfia.org/press/632. Accessed 12 Sept 2015. ExRx.net. Exercise prescription on the internet. Fitness testing. Calculators. Fitness. http://www.exrx.net/Calculators/OneRepMax.html. Accessed 12 Sept 2015.